In the film, Rango (Johnny Depp) is a pet chameleon who lives in a terrarium. He has long thought himself a hero, but then finds himself removed from his contemporary American southwest surroundings and ending up in an Old West town called Dirt, which is populated by various desert critters garbed like characters out of a spaghetti western. 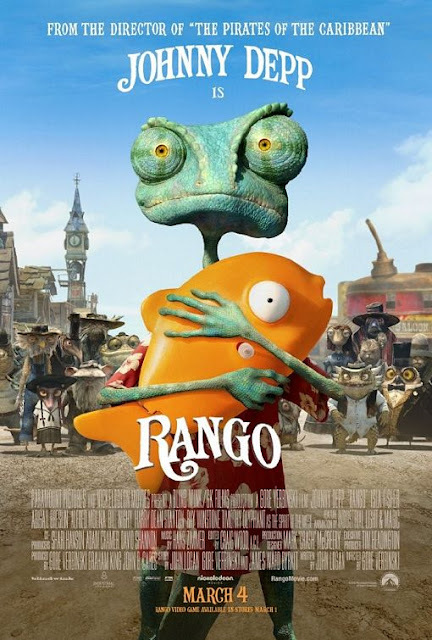 As he's always thought himself a hero, Rango establishes himself as the lawman, strolling the streets as a sheriff-like character. Unknown to him, the "good guy" role doesn't do very well in Dirt -- with a whole cemetery filled with good guy tombstones. But that doesn't stop Rango from trying, constantly seeking to fit in with his surroundings, no matter how challenging. At a certain point in the narrative, Rango will come to question everything about himself.